Foreign currency exchange is available in the international airports and in most local banks during the operating hours. For your convenience JadeLink Hotel cashes traveler checks, provides foreign currency exchange at the same rates as quoted by the Bank of China. JadeLink Hotel accepts major international credit cards and major banks’ debit cards for settlement of the hotel’s bills. Shanghai has two airports – Pudong International Airport and Hongqiao International Airport. Both airports operate international and domestic flights. Pudong International Airport – The airport maintains two terminals, which handles more international flights than domestic ones. Terminal 1 is for both domestic and international flights whereas Terminal 2 is basically for international flights. The airport is about 50 km from JadeLink Hotel. You can come to the hotel by taxi, Line 2 of the Shanghai Metro, or Shanghai Maglev. For details, please refer to the information page of the Local Area. Hongqiao International Airport – The airport maintains two terminals, it handles more domestic flights than international ones. Terminal 1 handles international flights, mainly to Asia including Tokyo, Seoul, Taipei and Hong Kong whereas Terminal 2 is exclusively for domestic flights. The airport is about 11 km from JadeLink Hotel. You can come to the hotel by taxi, or Line 2 of the Shanghai Metro. For details, please refer to the information page of the Local Area. 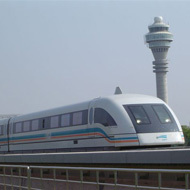 Located next to Terminal 2 of Hongqiao International Airport, the Hongqiao Train Station is being developed into a transport hub to make business executives and leisure travelers easier and faster than ever to mobilize themselves, by taking reliable and efficient high-speed trains, from Shanghai to the cities nearby in Yangtze River Delta, for example, Suzhou, Hangzhou and Nanjing. JadeLink Hotel is conveniently located in the center of Hongqiao CBD, so it only takes 20 minutes’ ride by taxi or the Shanghai Metro to travel from the hotel to the Hongqiao Transport Hub. Getting around Shanghai is easy and convenient. Taxi is readily available in the city 24 hours a day. Please contact our concierge for a taxi at any time. If you plan to stay in Shanghai for more than one week, it is recommended that you buy a Shanghai Public Transportation Card which can be used in most public transport facilities: taxi, buses, ferry, subway and light-rail. If you plan to hire a private car, our friendly Guest Relations Manager is happy to assist you with this so that you could arrive at your destination on time.